and haphazard ways) by unpaid family labour. 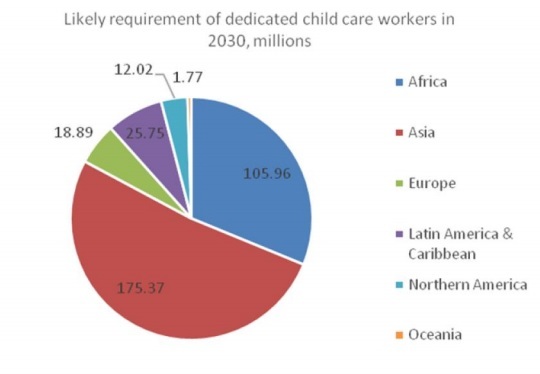 How can we even begin to estimate the likely future global demand for care activities, which include care of the old, the young, the sick, the differently abled, as well as the healthy adults who have different kinds of care needs including all the aspects of quotidian life? This is a huge area of work, made more complicated by the fact that so much care work is performed within homes and communities in often socially unrecognised ways. But it is possible to provide some initial estimates, based on current employment in care activities in societies where these are more developed and known to be better delivered. Suppose we take Sweden as the benchmark on the basis of which to estimate likely care requirements in the future, since Sweden is known to have a well-functioning (and largely public) health system and is also known to provide reasonable levels of child care and elderly care. Employment in care activities in Sweden relative to the target populations can provide an indicator of the desirable levels of employment. Of course, this is likely to be both optimistic (since most countries currently lag well behind Sweden in such provision) and an underestimate (since much of the employment involved in the provision of such care would not be captured by the occupational classifications alone). So this is clearly an imperfect measure, but nevertheless it provides some broad indications of the potential demand for care. Here, the Statistical Database of Sweden is used to identify the number of workers in certain care activities in 2014, and compared with the UN population projections for Sweden for 2015. The category of “health workers” includes health care managers, doctors, nurses, physiotherapists, psychologist and psychotherapists, other health care therapists and complementary medicine therapists, dentists and dental nurses and other health care assistants. These occupations together amounted to 762,806 workers in Sweden in 2014, which (given the estimated population of 9,779,426 in 2015) means an average of one such worker for every 12.82 persons. Now apply this norm to the UN population projections for 2030 for all countries, on the assumption that this is the desirable norm for other countries to try to achieve by 2030 (and is not unreasonable given the Sustainable Development Goals). 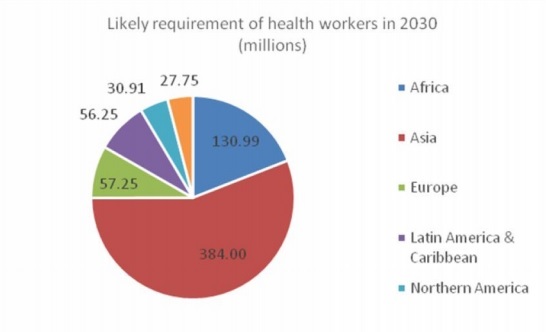 This gives estimates of the likely requirement of health workers in different regions and in the world as a whole in 2030, which can be compared to the projected working age population (assumed to be 15-59 years) in that year. Table 1 provides the results of this exercise in terms of the likely requirement of some categories of care workers using this norm. Several striking features emerge from this. 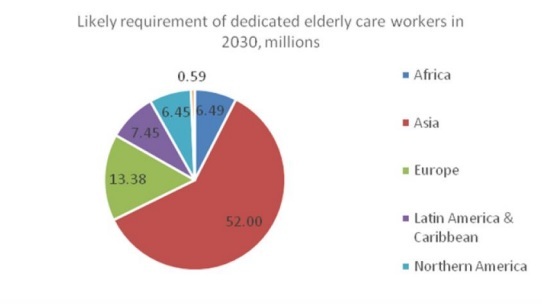 First, if reasonably adequate care services are to be provided to people across the world in 2030, this will require a massive increase in care employment, even in the very limited occupational categories mentioned above. Second, in most countries and regions, this is likely to be a significant proportion of the working age population – and therefore an even larger proportion of the actual employed population. Third, in terms of providing such services to a reasonable level, many more workers will be required in related activities as part of the support and administrative systems to deliver these services. Charts 1, 2 and 3 describe the estimated requirement in terms of the likely regional spread of this type of occupation in 2030. 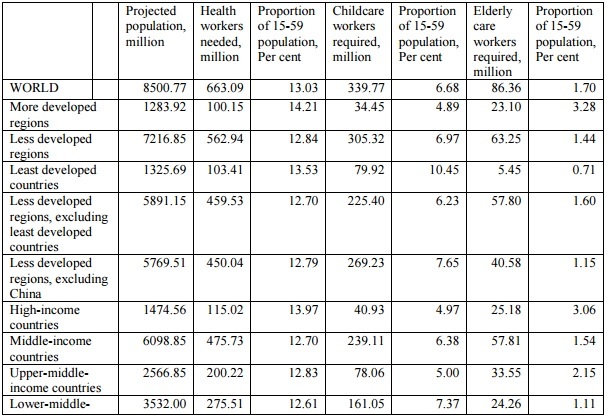 It is evident that Asia dominates in the requirement, simply because of its large population – but what is surprising is that, despite the current perceptions of a younger population than in other regions, the requirement in terms of elderly care is also going to be very large, amounting to well over half the total requirement in 2030. This basic and even simplistic exercise still provides some idea of the potential of the care economy to generate jobs in the future. But this will NOT be delivered by market forces on their own, and nor will such jobs be “decent work” if the market alone is to determine this. The need for state intervention – and for public provision of these essential care services – is therefore paramount. Originally published in Business Line.